With the Easter weekend fast approaching here in the UK, and with it traditionally being a time of home DIY projects and makeovers, I thought it fitting to write a post around some of the different jobs that can be achieved in just a couple of days. 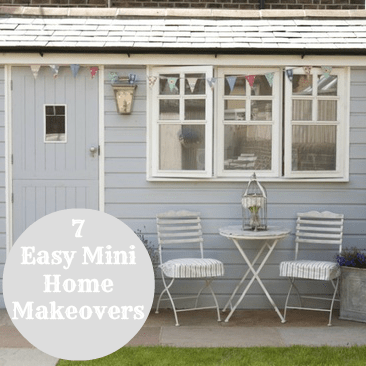 So here we have my 7 ideas for quick and easy home revamps over the Easter weekend. If the weather improves (which is looking seriously doubtful) it’s a great time to put on your gardening gloves and start clearing some of the debris from the winter. Why not give your shed a lick of paint in a fresh new colour, ready for the summertime? This is a great job, and easily achieved in a weekend, if the weather holds out. Got some energy? Why not give your kitchen a mini revamp by adding in some splashes of colour. Give one wall a bright paint colour and then accessorise with some lovely new tea-towels, oven gloves, a new blind and some colourful crockery. It doesn’t have to be expensive, some charity shop or high street finds will work wonders and you’re kitchen will feel like it’s had a spring freshen-up. All we need is the weather to go with it. Or if you do have plenty of time and feel your kitchen really needs some extra tlc, why not think about a kitchen cupboard revamp. Painting your cupboards will really give it a whole new look and feel, and could set you going down a completely new path in terms of your kitchen style. I love the blue in this shot below from www.housetohome.co.uk. It’s very striking and works really well with the stainless steel in the cooker and tiling. Are there odd jobs about your home that have needed some attention for a while? There certainly are in mine. This weekend we are going to tackle a fireplace. It’s an old Victorian fireplace surround that’s been propped against the wall now for quite some time! Hopefully that will all be finished and securely attached by then end of Good Friday. The Easter weekend is a great time to tackle a few DIY jobs that you’ve been putting off for a while, whether it’s putting up a few shelves, finishing off a little painting, or changing the curtains for lighter and brighter ones. It’s easy to look around your home and find things you’d like to change or improve upon. In the bedroom many of us head towards spring and want a new, fresher look for our beds. As the weather hopefully improves, we can throw off the many layers of heavy blankets and opt for a lighter look. So why not revamp your bed this Easter Weekend and treat yourself to some new bedding? If you have the space and budget you could even check out some new King size mattresses and beds! A big treat I know, but worth it! It’s a great chance to scour the shops, drag the children along and bounce on a few new beds! A Silentnight mattress is often my choice but it’s worth hunting around for one that suits you. I love the fresh green leaves on this bedding and it reminds me of the changing season and being outdoors. Easy to do in just a day or weekend, painting or wallpapering a feature wall will instantly give a room a completely different look. You can keep it subtle or really add some drama, the choice is yours, but there’s no doubt this is one way to totally update your decor. The Crown website is great if you want some inspiration or need to see how colours will work together. I love that you can turn down the lights on this site and envisage the colour at night-time. A great idea! 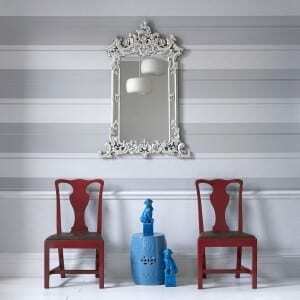 And if you’re looking for some new wallpaper then don’t forget to enter my Graham and Brown competition too. In our home, it’s always time to look at the children’s toy storage and figure out how it could be better. There are always new toys and games that don’t fit in the current boxes, or if they do it means that the said box is now overflowing. So take the time over Easter to sort through your children’s toys and update the storage where necessary. This lego storage is one of my favourites and if I had boys I would definitely own some of this! So, I do hope you have a lovely Easter weekend, whether you’re tackling a few DIY jobs or simply relaxing and catching up with family and friends. Do let me know if you’ve managed any mini makeovers though! A really great read, and you’ve definitely given me some inspiration and much needed enthusiasm to get off the sofa. I don’t do give to much of makeover to my house every Easter but I give complete makeover to my drawing room and my kids room. I wouls like to know what colour the garden shed is painted in this picture?